Torch bearers, school marching bands, marimba music, speeches, bombas, and street vendors will add a festive note to Independence Day (Sept. 15) celebrations that are held countrywide. Fittingly, the subject for this month’s photo contest was Guatemalan Patriotism. 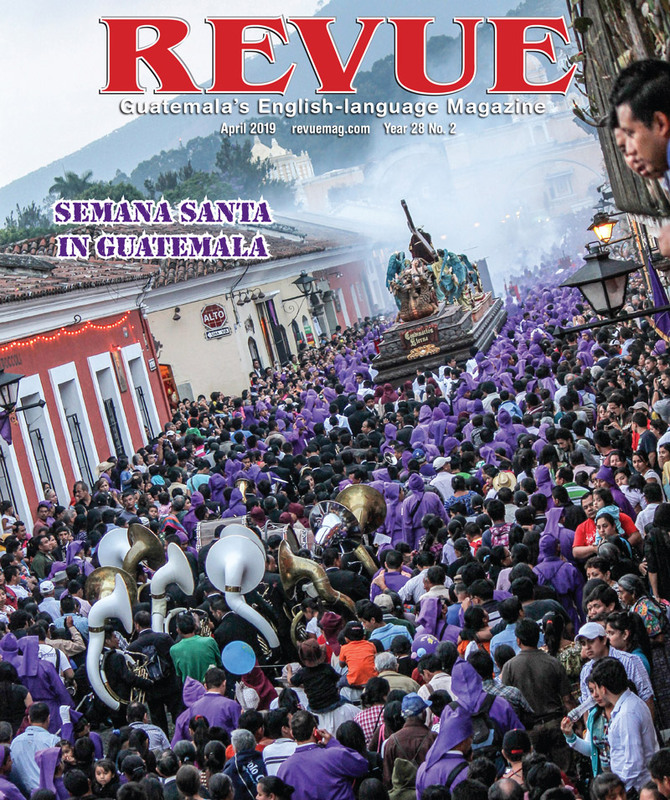 The theme is carried out on our cover with a photo submitted by Ana Lucía Marin Orellana. 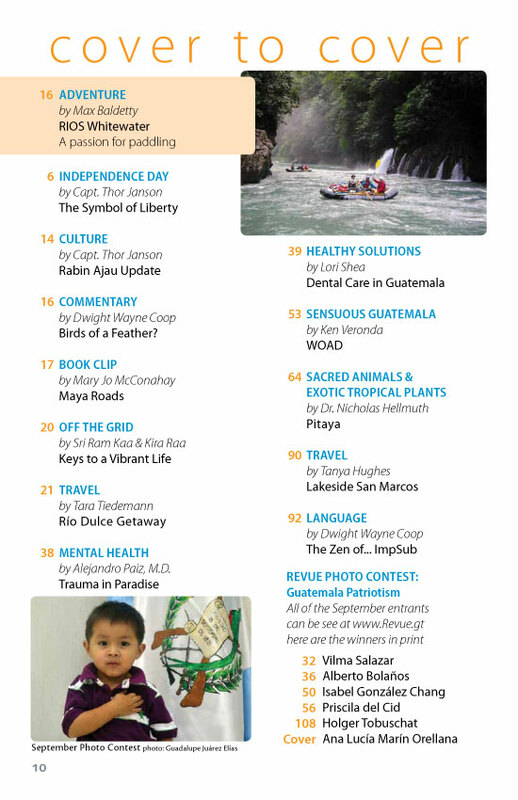 Congratulations to all the photo contest winners, their work is featured throughout these pages. All entries can be seen at www.REVUE.gt. We’d also like to thank our generous contest sponsors for some great prizes: La Peña de Sol Latino, Chamiza Wines, and Villas B’alam Ya at Lake Atitlán. 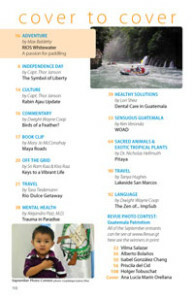 A sampling inside this month: An update by Thor Janson on the Rabin Ajau where 100 Maya princesses gathered in Cobán in July to compete for the title of Daughter of the King; Ríos Guatemala offers the back story of a documentary of the same name that will be showcased in La Antigua this month; writer Dwight Wayne Coop ponders the selection of National Birds in Birds of a Feather? We’re pleased to present Equal Day Equal Night by Mary Jo McConahay with an excerpt from her award-winning book Maya Roads: One Woman’s Journey Among the People of the Rainforest. In all there are 13 articles and a DateBook highlight that we hope will entertain and inform you. 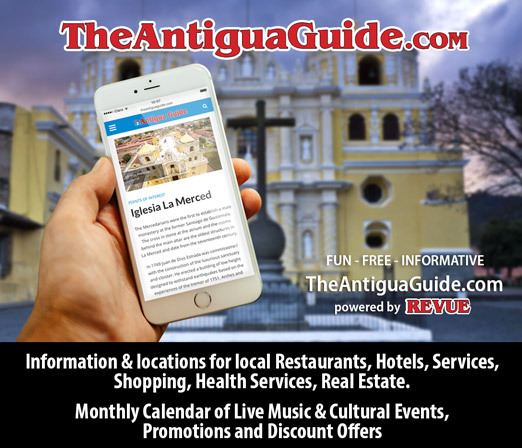 We’d also like to welcome the new advertisers to Revue and say thank you again to the many businesses and readers who help us promote the best of Guatemala.